388 pages | 19 B/W Illus. "John Beckett was a political chameleon: first at one with the fist-clenching left, then in awe of the goose-stepping fascists. He was also a Walter Mitty so who really knows? This author does. Francis Beckett's personal partiality doesn't blunt his fine journalist's pen nor cloud his judgement and integrity; but the pain shines through. He writes with compelling candour about his father. It is as moving for the reader as it must have been painful for the author." "The youngest Labour MP in 1925, by 1940 John Beckett was in prison as a danger to the war effort. His son has written a courageously honest, moving and sensitive account of a socialist who ended up despising the workers, a Jew who ended up hating Jews, a democrat who became contemptuous of democracy. It is a penetrating analysis of the political times in which he lived, not least because it illuminates the conditions that can – if freedom is not strong, vigilant and purposeful - breed bigotry and fascism. It is a valuable history as well as an instructive biography." "A fascinating insight into the unsavoury practices of the security services, and a moving portrait of a talented, wayward father who denied his Jewishness at great cost to himself and all around him." "John Beckett was a Labour MP who later took up with fascism. In Fascist in the Family his son Francis, journalist, historian and playwright engages in the difficult task of tracing his father's tempestuous and ultimately unfulfilled life. His readable, well-researched, questioning and honest biography serves as a British equivalent of My Nazi Legacy." "Part personal memoir, part historical reconstruction, Francis Beckett’s hugely readable book takes us into the murky worlds of right-wing extremism and the British secret state. As Beckett unravels his father’s disturbing history, and seeks to come to terms with it, he also reminds us of the conflicts of conscience, identity and family loyalty that so fervent a commitment to fascism inevitably produced." "This is a gripping account of a singularly tragic political life.This can't have been an easy book to research or write. Thanks to Beckett's intellectual and emotional honesty, however, it offers a fascinating insight into the complex personal origins of the politics of hatred, as well as a timely reminder that some of our most dangerous public figures possess uncommon human appeal." "In an attempt to reconcile the two sides of John Beckett’s character, Francis, has raked though the embers of his father’s life, and in the process unearthed a remarkable tangle of contradictions. In many ways it’s a desperate story. Francis Beckett never excuses his father — he’s clearly appalled by what he did — but at the same time there is an unmistakable undercurrent of affection here." "Francis Beckett has been an adornment of left journalism for 40 years. Now he has written this remarkable book about his father John Beckett.This is a beautifully written account of British fascism written from the inside – a fascist family story in every sense. Francis Beckett’s masterly biography of his fascist father should be read by all who want to know where the left can go wrong." "Fascist in the Family makes for fascinating reading at a time of economic and political uncertainty. Francis Beckett has provided a unique insight into what happens when a man, apparently devoted to the good of the common people, turns to racism and hatred to pursue his personal political vision." "Francis Beckett has written a moving account of growing up under the shadow of fascism. He provides both hard academic analysis and a personal account of the pain and havoc caused by extremist politics." "Francis Beckett weaves this story of family, fascism and failure with considerable skill. It must have been difficult for the author to confront the painful ‘sins of the father’ again but we should congratulate him for making that effort as this succeeds admirably as memoir, biography and political history. From a life doomed to failure and hate, he has created a lasting literary triumph." "Francis Beckett vividly charts how his father’s shortcomings, combined with the twists and turns of the interwar left, led him towards fascism." "Francis Beckett’s poignant and compelling biography is the story of a family, as well as a political history. It’s rich in detail, from the glimpses of appalling social norms to the strange mixof personalities who fetched up in the casserole of public life." "This fascinating book gives us a moving account of his father’s decline. This, and the keenly researched and scrupulously impartial examination of his father’s earlier career, makes this a very important contribution to our understanding of the complexity of some of the forces that brought people to choose fascism as their creed." "The sheer scale of the research and personal interviews he has carried out suggests a momentous cathartic process and the subject matter belies the pleasure of reading it." 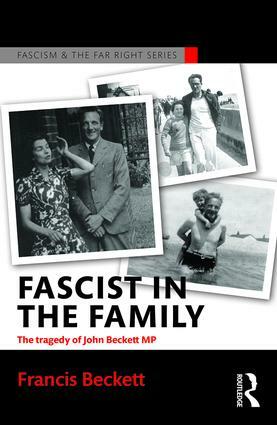 "In his extraordinary book, Fascist in the Family, Francis Beckett, acclaimed journalist and contemporary historian, chronicles how his late father, John, went from being a popular Labour MP to becoming propaganda chief for fascist leader Oswald Mosley. The events took place more than 70 years ago but the issues of racism, nationalism and anti-semitism have strong resonances today." "Beckett's account of his father's embrace of anti-Semitic pro Nazi politics is as absorbing as it is salutary in its explanations of the transformation of radical socialist to racist national socialist." "Sharp-shooting radical journalist and writer Francis Beckett…has followed the paper trail with consummate energy and the detail of political life, especially in the inter-wars years, is absorbing. This is a most readable study and a painful one too as one begins to gauge the effect of John Beckett’s chequered career on his family." As featured in The Guardian, on BBC Radio 4 Today Programme and on BBC World Service. Francis Beckett is an author, journalist, playwright and contemporary historian. His eighteen books include biographies of four Prime Ministers, the first of which is about his own political hero, Clement Attlee. He has written for several national newspapers, but mostly for the Guardian, for which he was a regular feature writer and reviewer for many years. His plays have been performed on radio and at the London Fringe. He is a former president of the National Union of Journalists and a Labour Party and trade union press officer and editor, and is currently editor of Third Age Matters, the national magazine published by the University of the Third Age.